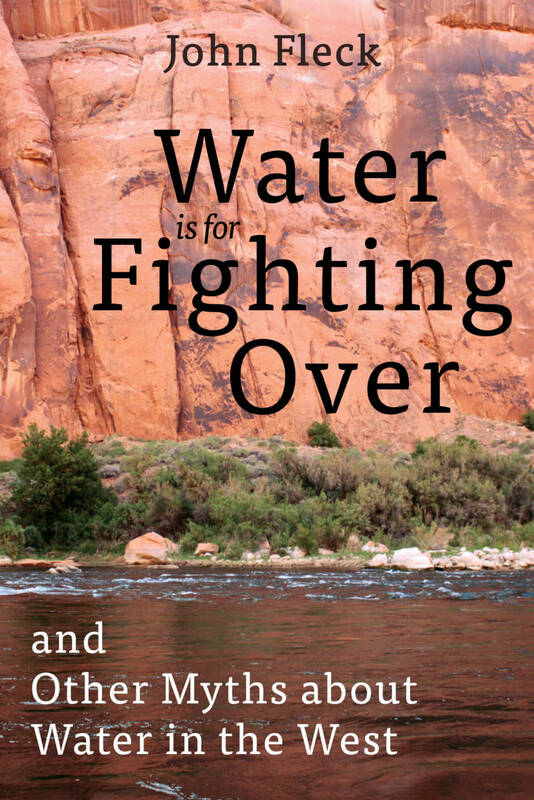 Excerpt from the introduction to "WATER IS FOR FIGHTING OVER… and Other Myths About Water in the West." Standing in the dry bed of the Colorado River at San Luis in the Mexican state of Sonora, just south of the Arizona border, Manuel Campa was insistent. The Mexican border city, perched on a low mesa to the east, is not just “San Luis.” It is “San Luis Río Colorado.” “It’s the only city that has the name ‘Rio Colorado,’” Campa, technical director of the city’s water utility, told me as we strolled the river’s sandy bottom on a warm spring morning. It took imagination to grasp what Campa was getting at. Nineteenth-century steamboats once passed this spot. The Colorado was once a river here. No more. The only thing capable of navigating the Rio Colorado’s bed that day was a four-wheeler with fat tires. Tamarisk, a scrappy invasive shrub, had long ago replaced native cottonwoods and willows along the river channel. Water-loving beavers, once common, seemed a comic impossibility. Over the last century, we have taken the river’s water, moving it through dams and canals to grow a hydraulic empire of farms and cities across the semi-arid Colorado River Basin. By the time the Colorado River approaches its feeble desert end, most of its water has been diverted to Denver, Albuquerque, Phoenix, Las Vegas, Los Angeles, Mexicali, and vast farmlands in between. Morelos Dam, twenty-two miles upstream from San Luis, diverts Mexico’s share of the water—the last of the river—to the rich, productive farmland of the Mexicali Valley and cities to the west. The first time I saw this, I was stunned. Driving the Yuma County levee past Morelos Dam in 2010, I saw the last trickles of water from leaks in the dam and a shallow water table disappear within a few miles into a sandy, dry channel. This great river, the Colorado, around which I have spent much of my life, whose water I have showered with and drunk, which has grown the food I eat and floated my boats for hundreds of miles, simply disappears into the desert sand. But that spring day in 2014, Campa and I were awaiting something remarkable. In the midst of fourteen years of drought, with reservoirs dropping upstream and fears of water shortage gripping the Colorado River Basin, water managers were creating a modest “pulse flow,” meant to mimic a natural spring flood through the desiccated delta. It was a test of how much water would be needed for native plants to come back to life and repopulate the area. But as the water arrived at San Luis, and for the weeks after, it became something more. The usually dry riverbed past the town turned into a fiesta as children who had never seen water here frolicked in a briefly flowing Rio Colorado. And at another, deeper level, it demonstrated unprecedented international cooperation to achieve a goal once thought impossible. For much of my professional life as a writer, chronicling our uneasy existence in this arid place, I embraced this narrative. When I wrote stories about drought for the Albuquerque Journal, we had an office joke about “the obligatory cracked mud photo.” The paper’s photographers and I would hover over stream-gauge data to find the driest stretch of New Mexico’s rivers, and it was always a bonus if they came back with an image that included a dead fish to punctuate the message. These stories resonate, dominating our understanding of life in the arid West. Thus it is that the classic movie Chinatown has come to stand in for the history of Los Angeles water. It is a tale of villains bent on profit, messing with nature, and ultimately punished for their sins. To many, Chinatown represents water management in LA, despite historians’ best efforts to remind us that it was just a movie, that things didn’t really happen that way. Perhaps no work is more important to the West’s narrative of crisis than journalist Marc Reisner’s epic Cadillac Desert, ominously subtitled The American West and Its Disappearing Water. Its core message, one commentator wrote later, was that the overbuilding of dams and overuse of water in the western United States would “catalyze an apocalyptic collapse of western US society.” Whether that is a fair characterization of Reisner’s work is an open question. Cadillac Desert has become shorthand for the water crisis, with all varieties of doom attributed to Reisner. Like many who manage, engineer, utilize, plan for, and write about western water today, I grew up with the expectation of catastrophe. I first wrote about water shortage in California during that same late-1980s–early-‘90s drought Reisner bemoans. But as drought set in again across the Colorado River Basin in the first decade of the twenty-first century, I was forced to grapple with a contradiction: despite what Reisner had taught me, people’s faucets were still running. Their farms were not drying up. No city was left abandoned. I began asking the same question, again and again: when the water runs short, who actually runs out? What does that look like? Far from the punishment of an indignant God, I found instead a remarkable adaptability. In Doña Ana County on the Rio Grande in southern New Mexico, I saw farmers idle alfalfa and cotton fields, crops that bring low returns for each gallon of water, shifting scarce supplies to keep high-dollar pecan orchards healthy and productive. As water supplies dropped to record lows, farmers continued to prosper. New Mexico’s cities fared just as well. In the midst of the drought, Albuquerque cut its per capita water use nearly in half, and the great aquifer beneath the city actually began rising as a result of a shift in supply and reduced demands. Across the Colorado River Basin, I found the same story over and over, from the fountains of Las Vegas and Phoenix to the farms of Imperial and Yuma counties, to the sprawling coastal metropolis of LA. When people have less water, I realized, they use less water. In spite of the doomsday scenarios, westerners were coping, getting along with their business in the face of less water. Things might have been easier had we not made the mistakes Reisner so ably documented, but we did what we did and, as scarcity sets in, we are adjusting to the new realities. I have witnessed this resilience time and again as I travel the hydraulic landscape of the western United States. This book chronicles my attempt to understand and explain where that ability to adapt comes from, how it works, and how we can call on it to get us through the hard times ahead. The catastrophe narrative isn’t just inaccurate—it promotes myths that actually stand in the way of solving our problems. Most obvious is the myth that “water’s for fighting over.” The quote is wrongly attributed to Mark Twain, but it’s also just plain wrong. Fighting rarely solves water problems, and scholars have found that collaborative agreements are far more common than winner-take-all fights, whether in the courts or with guns. The most pervasive of the myths is that we are “about to run out of water.” I’ve heard it countless times, and it usually follows a predictable pattern. Today, we need this much water to support this many people and this much farming. As either grows, we’ll need more water, the narrative would suggest. When the “need” line crosses the supply line, we will “run out.” This ignores history, where again and again we have seen both city and farm communities adapt and continue to grow and prosper without using more water -- often, in fact, using less. But that deeply held fear of “running out” of water feeds back into the first myths, triggering a limbic response to protect “our share” against others. And therein lies the risk. If everyone ignores their own adaptive capacity and simply fights for more, or even fights for the share they’ve got now in a shrinking system, we are led headlong into conflict, with dangerous results. If instead we recognize our ability to make do with less, and invest in institutions that facilitate water sharing, we can create systems for robust, flexible, and equitable water allocation. Only then can we preserve the West that we have all come to inhabit, know, and love. There are success stories in the recent history of the Colorado River’s management. The first type of success story involves communities that have found a way to use less water. It happens at many different scales and among many different types of water users. Big cities, like Albuquerque and Las Vegas, have shown remarkable conservation success, with populations continuing to grow in recent decades even as water use goes down. Regional water managers at agencies like the Metropolitan Water District of Southern California and the Central Arizona Water Conservation District have developed innovative, flexible new approaches to managing supplies; storm-water capture, sewage reuse, aquifer storage, and other similar innovations have diversified sources of water and provided a buffer against drought. Farm communities also have demonstrated the ability to do more with less, with agriculture thriving in California’s Imperial Valley and Yuma, Arizona, even as they face pressure from outsiders charging that their water use is wasteful. These stories are crucial in part because they show communities working with the cards they were dealt. When fighting over water, it is easy to say, “We can no longer afford to grow alfalfa in the desert,” or “We can no longer afford a Phoenix or Las Vegas.” Simply cutting off a few limbs would eliminate the deficit that causes the reservoirs to keep dropping. I reject that approach for two reasons. First, there are questions of justice and equity in deciding which communities stay and continue to use water and which communities must go. Second, though, and more important, we have no omniscient power giving us the ability to decide which water uses will continue. When we decide our future, the Imperial Valley and Las Vegas are at the table, defending their right to exist. As a result, the only tractable plans are ones that work with current water users. But these successes have not been enough, something that can be seen most clearly in Lake Mead itself, the first great reservoir that stores the Colorado River’s water for millions of people downstream. Despite the hope offered by the success stories described above, we have not done enough. 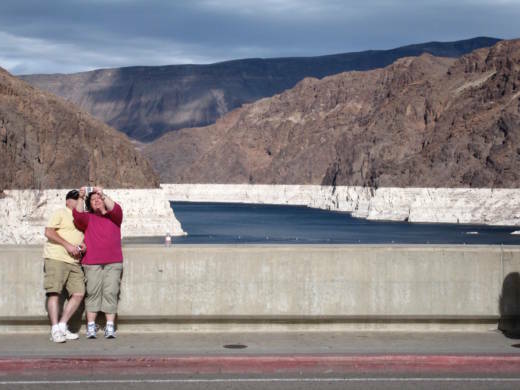 Lake Mead continues to shrink. Water users continue to take more out of the Colorado River system than nature puts in, keeping us on an unsustainable path. The network is a sometimes formal but often informal group of lawyers, engineers, hydrologists, farmers, water managers, diplomats, and environmentalists who have been working together on these issues, often for decades. Meeting in conferences, on river trips, and in hotel bars, they must hold the seemingly contradictory goals of zealously guarding their own communities’ water supplies while at the same time figuring out how we all can share as shortage looms. This disparate group keeps what one participant has described as a “laser-like focus” on the big problems posed by the dropping reservoirs. They are the ones who have to figure out how our society can live with less water. This is where our adaptive capacity must come from. Scholars have found that collaborative agreements are far more common than winner-take-all fights, whether in the courts or with guns. The first time I wrote about Terry Fulp, a key manager with the Bureau of Reclamation, I described him as “the closest thing we have to a guy with his hand on the tap that controls the vast plumbing system built over the past century to distribute the Colorado’s waters.” But I have come to realize in the years since I published that line in 2009 that, in reality, no one has their hand on the tap, and nobody has the ability to turn it down. Instead, we’ve built a decentralized system with no one in charge. This means that the only possible solutions are those that can emerge from the collaboration of the network. That is why the scene I stumbled on one late afternoon in March 2014, in the sandy bed of the Colorado River near the Mexican town of San Luis Río Colorado, was so heartening. For those brief few weeks, water was flowing and the residents converged on the normally dry riverbed for a rollicking, soccer-ball-kicking, four-wheel-driving, beer-drinking party. Remarkably, the Colorado River Basin’s managers had all agreed to lower Lake Mead just a bit, to release some of their precious water, in order to bring a dead river channel in Mexico back to life. I rolled up around suppertime after a day with a group of scientists and journalists. There seemed no finer place on Earth at that moment than the party beneath the San Luis Bridge. 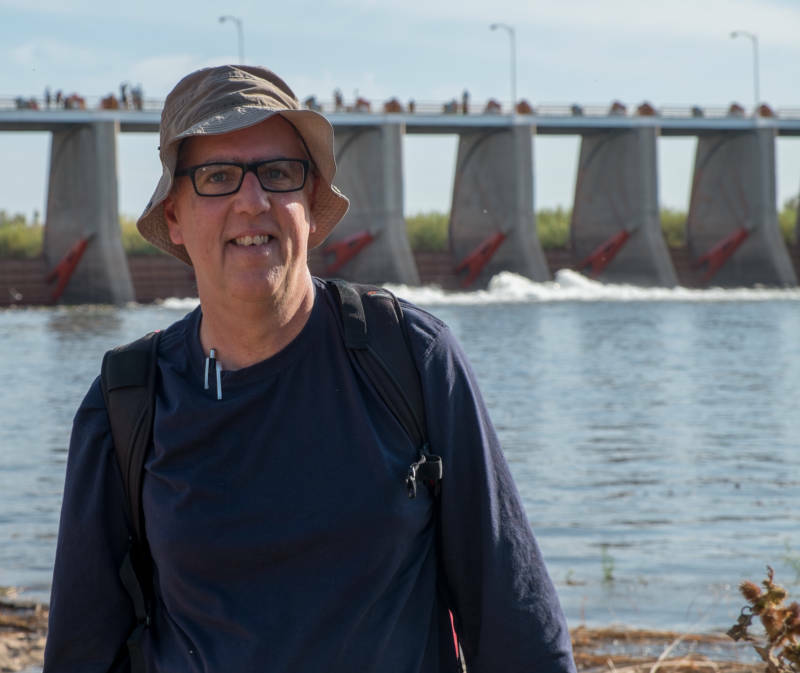 There, amid the festivities, with no tie, barefoot, his suit jacket off and the legs of his dress pants rolled up, I found Terry Fulp with a group of friends, wading in the Colorado River. Fulp had been part of a stuffy official delegation earlier in the day, driven in armored State Department Chevrolet Suburbans to tour the newly flowing river. But at their last stop, Fulp bailed out of the official caravan to get a ride home with his friends, a group of environmentalists who had been working for more than a decade toward this day. This was the network—old friends on opposite sides of what were once great divides: the conflict between environmentalists and the West’s great water management agency, the conflict between Mexico and the United States, and the conflict between farms and cities for scarce water. They were standing, smiling themselves silly, in a river channel in Mexico, sharing a historic moment as a river slipped past them on a trip to rejoin the sea.